I went on a journey recently. A journey through the recesses of my mind to find a new front door paint color that really SPOKE to me. That was the epitome of my personality. That shouted out to the world who the heck I was! I have had the same paint color on my front door for the last 5 years or so. Here it is from Fall 2013 (where apparently I had shrubs trying to eat my front porch). It was called Weathervane by Sherwin Williams, which is a perfectly fine paint color (I don’t have a beef with you, Sherwin Williams), but I was longing for something more than just “fine”. It’s just not the paint color that I wanted to define myself by at this point in my life. 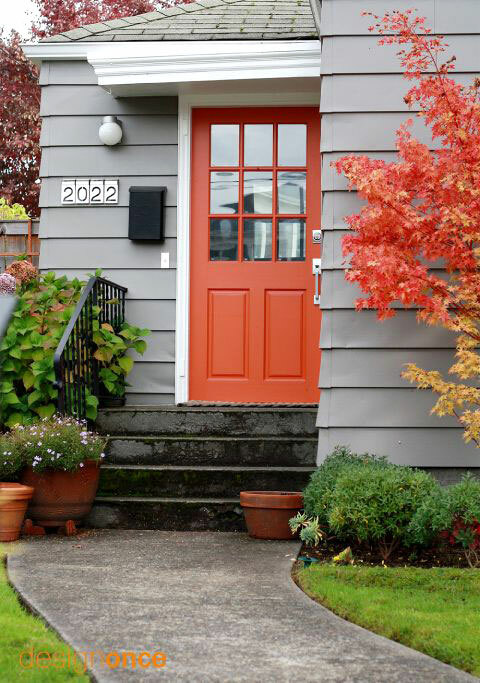 And like it or not, your front door paint color defines you. To your UPS driver, to the mailman, to the neighbors driving past the house. OK, some people call it “curb appeal”. I prefer to think of it as being a permanent house tattoo, that when spelled wrong you will regret the rest of your life. Do I take front door paint colors too seriously? Maybe, but it’s been a long hard hot summer and I needed something to obsess over. 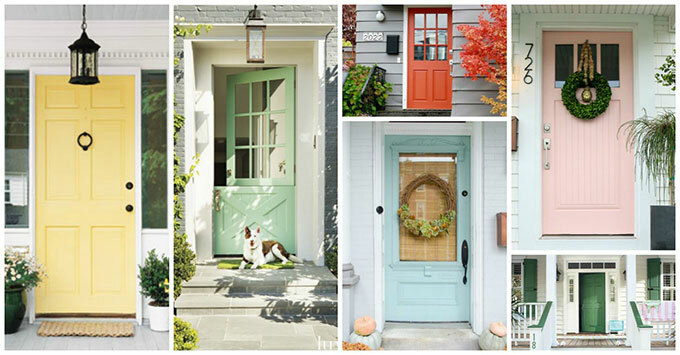 So I took a tour of Pinterest to see what was poppin’ for front door colors this year! What is not to love about a serene blue door. So inviting. 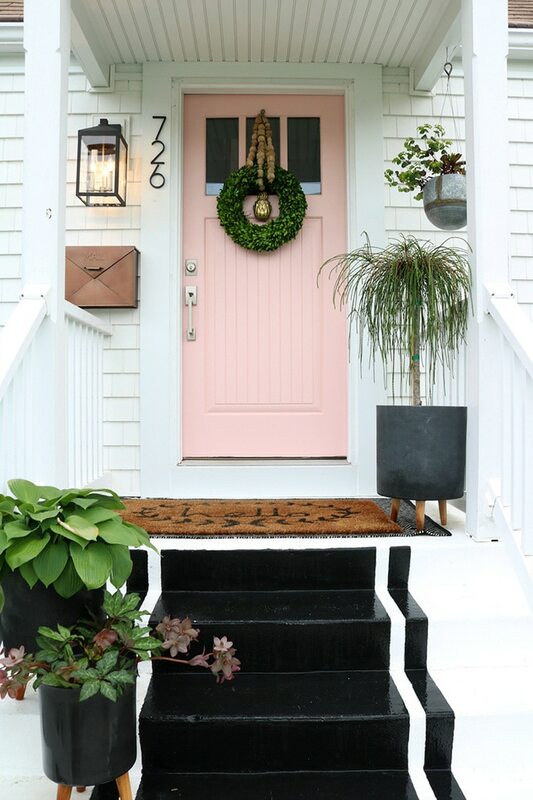 I wanted to paint my front door pink. I really wanted to be that girl. Maybe next time I will have the guts to just go for it! This green reminded me of a farmhouse green. That basic utilitarian green that farmer’s use to paint their steps. Or tractors. And hello, this yellow had the perfect name for me! I had toyed with using something close to a Jadeite green. How fun would that have been! And at one point I had even thought of going with an orange. I was afraid that might have been inspired by the fall season coming up and I would regret it once the seasons changed. Glidden’s Capri Teal (50GG-43/213) from The Home Depot which I think is the perfect combination of turquoise with green undertones. Normal folks would call that teal. Glidden did. My door is finally bright, bubbly and a little bit flirty for this side of town. I don’t regret this tattoo one bit. If you follow me on facebook you know I did have some special issues with painting it, so I will leave the how to’s for another day. What color is your front door? 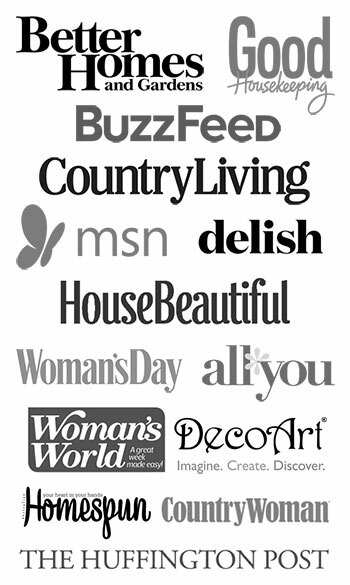 Does it define who you are? I am painting mine when the weather gets a little cooler—it’s nearly that exact yellow. It looks great with our pale gray siding. I SERIOUSLY thought about the pale yellow. I brought home at least 20 paint chips and couldn’t find one that looks right with my tan/beige siding though. In my next life I’m going to have gray siding! Winner! My front door is a safe, boring gray. Blah! I need some pop there. Gray brick, slate colored siding. So many choices. Enjoy! I like your teal door best out of all of those fancy doors that Glidden or Ben Moore PR people painted. I feel like it’s much more turquoise than teal though? 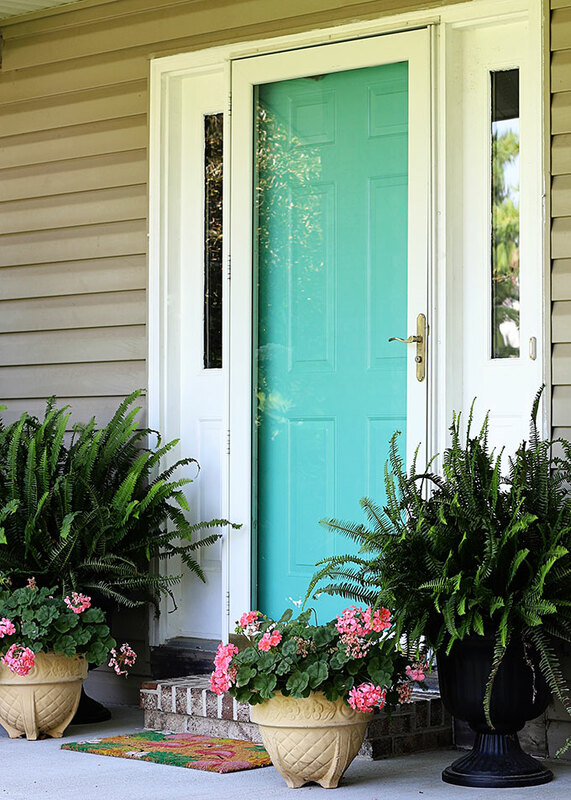 Love the color of teal on your front door. Sooooo inviting and pretty Pam. 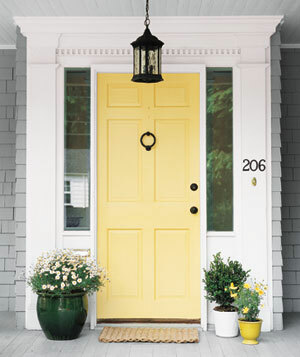 I had a yellow front door on my old house and loved a door with color and personality. I am thinking about painting my front door too. Love your choice. Great job. Your door is so pretty, Pam! 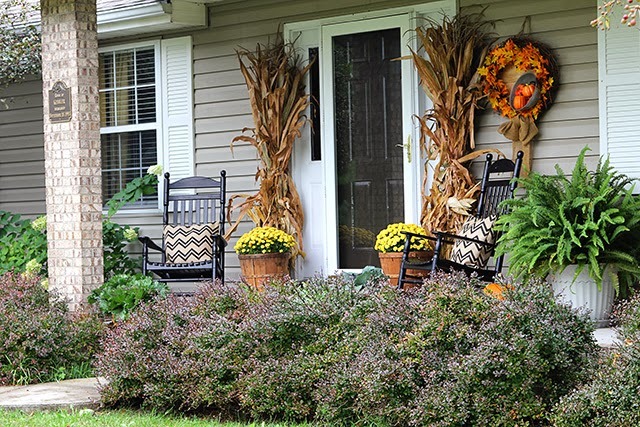 It looks beautiful with the pink flowers…and I can just see it with fall and winter decorations, too! Jadeite?! That was my inspiration for the color I just picked for my front door. Didn’t know I was being trendy. I have a bright red front door that looks great but it’s time for a change and I picked up paint in a fun coral . going to try to get it done this weekend. Currently ours is a boring mahogany brown, but…it’s not that boring or blah…it’s just bright and festive, which I long for occasionally. It is a great compromise between me and hubs, so I’m satisfied. Loving your door and agree with Kari that it looks more turquoise than teal to my eyes, however, whichever…it’s festive and gorgeous with your decorations. I enjoyed seeing the pink and the yellow choices, also. 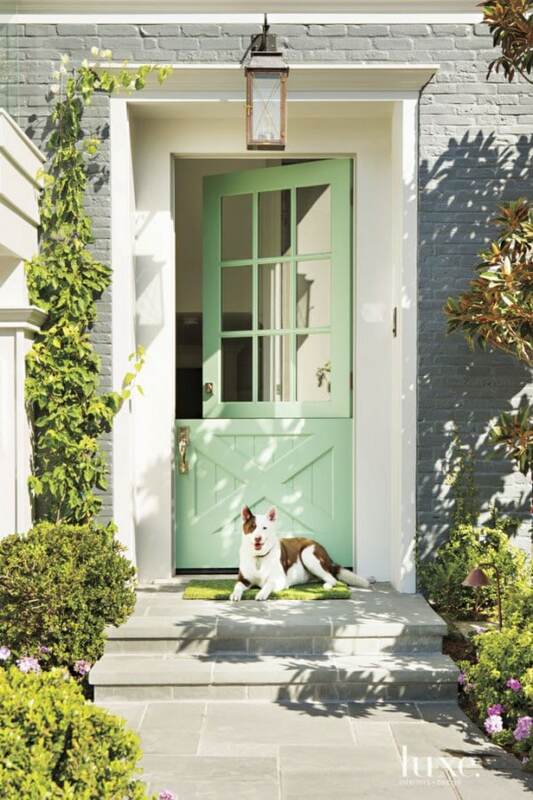 Doubt hubs would ever be able to handle a pink door, however he’d love a green door!! I’m sure I’ll get tired of this brown before hubs cooperates with compromising on the shutters to match, or coordinate, at least. But, at our age it’s not such an issue anymore. 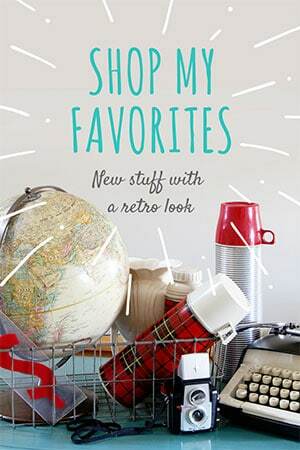 He did shoot down my idea for the turquoise, yellow or red doors…. I don’t mind compromising on these things so much, as I save the real battles for what counts! LOL You doing your own painting…well, 5years isn’t so long of a time. We live in an association-governed development, so we aren’t allowed to paint our doors. They are all white. If I could paint mine, it would be the one you chose. It’s colorful, but classy. I do too and it’s very restrictive including exterior paint. I’ve always had a beautiful front door usually deep red or burgundy. 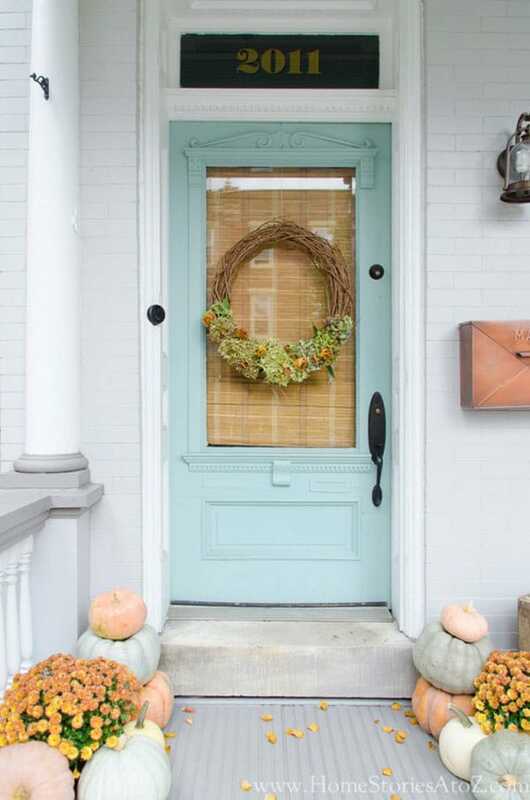 A long time ago for my first home I painted my classic arch top front door a persimmon and exterior was a light fern green it was a knock out and people would take photos. Another suggestion each holiday time I hang a themed wreath. Being March I have a large shamrock hanging on my door bought it at Joann’s Fabrics. Valentine one just came down. I Like the spirit of the monthly traditional themes to prevail inside and out including a holiday decorated table. Thanks for great article on doors. 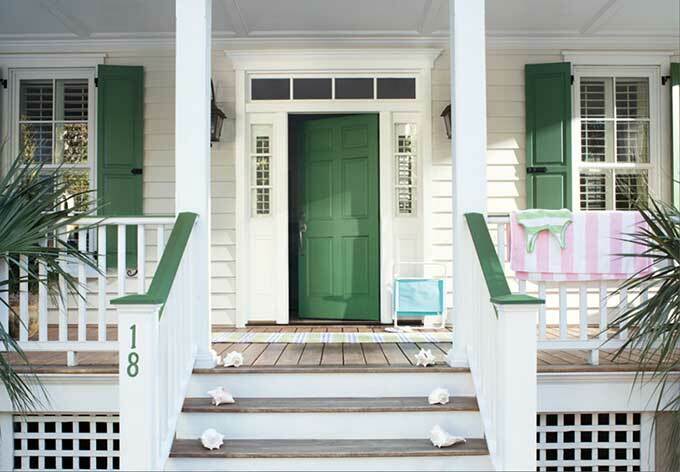 I love “depression green” which is jadeite – I picked out a color by Sherwin Williams 20+ years ago when we built our home and I painted ALLLL those shutters and front door. They changed their base so when I went with the same color of Peppergreen about 10 years ago when we built my shop, it was completely different. We got new windows and shutters and I now found a match pretty close to my original. So…even though it’s been 20 plus years, I still love my pale creamy yellow siding with my green doors and trim. Even the chicken coop matches! I would have done pink, but our little bit of brick work is kind of a coral/reddish which goes good with the green! Love your choice of color -it looks great!! I had the cedar siding on my house painted a medium dark gray and I chose purple for my front door a few years ago. The painter tried gently to talk me out of it, but even he loved the results and has it on his website now. It is beautiful, not overwhelming at all, and it makes me happy every time I pull into my driveway. Yes, it’s totally me. 🙂 I really like your new door color, too.